Healthcare Social Worker - Provides individuals, families, and groups with the psychosocial support needed to cope with chronic, acute, or terminal illnesses. Services include advising family care givers, providing patient education and counseling, and making referrals for other services. May also provide care and case management or interventions designed to promote health, prevent disease, and address barriers to access to healthcare. Healthcare Social Worker career is part of the Human Services cluster Family and Community Services pathway. Collaborates with other professionals to evaluate patients' medical or physical condition and to assess client needs. Advocates for clients or patients to resolve crises. Refers patient, client, or family to community resources to assist in recovery from mental or physical illness and to provide access to services such as financial assistance, legal aid, housing, job placement or education. Investigates child abuse or neglect cases and takes authorized protective action when necessary. Counsels clients and patients in individual and group sessions to help them overcome dependencies, recover from illness, and adjust to life. Plans discharge from care facility to home or other care facility. Monitors, evaluates, and records client progress according to measurable goals described in treatment and care plan. Modifies treatment plans to comply with changes in clients' status. Identifies environmental impediments to client or patient progress through interviews and review of patient records. Organizes support groups or counsels family members to assist them in understanding, dealing with, and supporting the client or patient. Bereavement Counselor - Provides support to terminally ill patients and their families. Domestic Violence Advocate - Advocates on behalf of community members that have been victims of domestic violence. Hospital Social Worker - Mobilizes and makes community resources available to individuals or groups affected by chronic illness or trauma. Outreach Coordinator - Works for a non-profit, medical or community outreach organization and organize fundraisers, media events and other services. 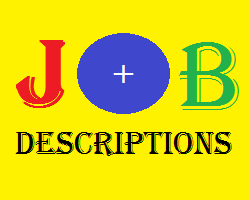 Belum ada Komentar untuk "Jobs Description of Healthcare Social Worker"